Since mid-1964, Mustang has always been about muscle, looks, and loads of customization options. BORLA’s lineup for the 2010 Mustang GT and Shelby GT500 lives up to this legacy, with systems to meet a wide variety of performance goals and budgets. For soundaholic Mustang GT drivers who won’t settle for anything less than unbridled performance with a pure, aggressive pony car growl, BORLA® offers a Cat-Back™ (PN140318) and Axle-Back (PN11777) system, each featuring BORLA’s cylindrical S-Type mufflers. Both are also available with BORLA’s more sound-absorbing Touring mufflers (PN140319) and (PN11778), for sleeper fans who prefer to be more subtle about their power upgrades. Responding to the high-output exhaust needs of the supercharged 2010 Shelby GT500, BORLA® engineers developed a specially-tuned Multicore Cat-Back™ system (PN140320) which includes an X-Pipe. BORLA’s patented high-velocity Multicore design distributes exhaust gases through multiple straight-through perforated cores. A race-tested innovation, Multicore technology is also utilized in BORLA’s elite XR-1® mufflers used by winning teams in NHRA, Baja 1000 and many other racing venues, and has been proven to actually outflow a straight pipe. GT500 owners who want the performance boost of a BORLA® exhaust but prefer a sound just slightly louder than stock will find a perfect fit in PN140321, a Touring Cat-Back™ system. All of BORLA’s 2010 Mustang GT and Shelby GT500 systems feature high-quality austenitic stainless steel construction, ultra-smooth mandrel-bent 2.5” tubing, flawless welding from master craftsmen, mirror-polished 4” diameter angle-cut 12” dual tips with rolled edges, and an unrivaled Million Mile Warranty. 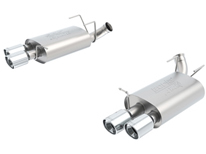 From the dimensions and perforation patterns of the inner cores to the amount of composite filament packing, all specifications of BORLA® mufflers are tuned on a vehicle-by-vehicle basis for an optimum blend of performance and sound. Combined with distinctive motorsport styling, easy bolt-on installation and enhanced fuel economy, the world’s most winning exhaust continues to lead the industry it founded over 30 years ago.